– optional Light Canister Set available for fun after the sun sets! RPM is proud to offer a unique front bumper system for the Associated SC10 2wd. It is designed with two primary purposes – first and foremost is durability while second, it has to look good doing it! Our goals have been met with an overwhelming success. Our front bumper system is designed in three pieces. The most critical piece is our unique chassis brace. This brace bolts to the bottom of the chassis using existing holes to help reduce the possibility of chassis breakage through frontal impacts. We achieve this by using 6 mounting points – both servo mounting screw holes and all four bulkhead screw holes. By tying in all 6 locations with a stout, molded nylon plate, we create a perfect foundation for the RPM front skid plate. The new RPM front skid plate ties into the same four bulkhead screw holes as the chassis brace but we went a step further and added two extra skid plate mounting holes to help disperse frontal impact energy over a larger surface area. This design protects the front bulkhead much better than the stock bumper. Additionally, we’ve eliminated the stock front bumper loop that ties into the front shock tower. By eliminating that piece, it allows the front bumper much more room to absorb impacts while transferring zero impact energy into the fragile front shock tower. The massive front curve of the skid plate does two things – creates a progressive impact zone that steadily absorbs more and more impact energy as the bumper compresses. The curvature also creates a great transitioning surface for those less than stellar landings or unexpected obstacles that “pop up” in front of the truck. The final piece to our front bumper is an already battle-tested front bumper. 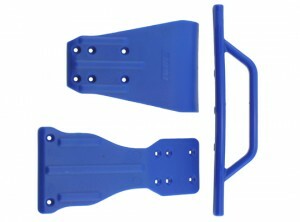 It is the same bumper as those used on our Slash front bumpers. What that means is superb impact absorption combined with the ability to accept RPMlight canister sets (RPM #80982 & #80983) for nighttime fun! That’s right, now SC10 owners can light up the night too! Combine RPM front bumper light canisters with an RPM roof-mounted light bar set (RPM #80922, #80923 & #80925) and that’s a whopping 10 LED’s worth of night burning light! Want more? How about bolting our rear tail lights (RPM #81030) to the SC10 too? Yes, it’s possible! Check them out for more details.